Manchester United have lost the Derby to rivals City by a score of 2-1. The stakes were as high as they possibly could. City came into the game 8 points ahead of United, meaning that it was almost a must win for the Red Devils at Old Trafford if they wanted a chance to put pressure on the title race. Mourinho was forced to alter his lineup due to the suspension of Paul Pogba. He decided to pair Herrera with Matic in the centre of midfield, with Rashford, Martial, and Lingard in front of them. Lukaku got the start at striker, and was motivated to shake off the stigma against him when he plays big clubs. Jose decided to go with a back 4 as well, with Smalling partnering Rojo in the middle, with Young and Valencia out wide in the fullback positions. The City lineup was less interesting to examine, with the only talking point being Pep’s decision to start Gabriel Jesus over Aguero. It was a tame affair at the start, as most games of this magnitude tend to be. It became evident that United would allow City time on the ball, while hoping to hit on the counter attack. Rojo went for a header in midfield, but missed the ball and had a nasty looking clash of heads with David Silva. The United defender was worse for wear, and started to bleed as a result of a cut on his forehead. He was given a bandage to wrap around his head, as was allowed to play on. David De Gea then proved he is the best goalkeeper in the world. A long switch from De Bruyne picked out Sane on the right wing. He isolated Young, and got by him, smashing a shot high at the United goal. However, De Gea was up for it, and quickly got his hand up to punch it away. City kept the pressure up, and were rewarded with a goal shortly before the break. A corner was whipped into the area, and wasn’t cleared properly by United. It fell to the feet of David Silva, who was unmarked, and he poked it past De Gea. It was deserved, but United will be annoyed that they conceded off of a set piece. The goal kicked United into life, and the Red Devils were able to grab a goal right before the half. A long ball from Young was poorly dealt with by the City defense, and it fell right to the feet of Marcus Rashford. The academy product kept his nerves, and slotted it past Ederson to tie the game. Both teams made a change at the half, as Gundogan came on for Kompany, while Lindelof came on for Rojo. United came out the better of the two teams to start the half, as they finally were able to control the ball in the midfield. They also created the first chance, when Martial found Rashford, who whipped in a cross into the area, but City were just able to clear it away. Disaster struck for United, as City grabbed their second goal after a comedic mistake from Lukaku. De Bruyne crossed in a free kick, and it was headed right to Lukaku. However, the Belgian absolutely fluffed his lines, and hit it right off the back of Smalling. It bounced perfectly to Otamendi, who couldn’t believe his luck, and the defender poked it past De Gea to give City a 2-1 lead. The game begun to open up, as United pushed forward to try and equalizer, while City were constantly hitting back on the counter. Martial drew a free kick on the edge of the penalty area. 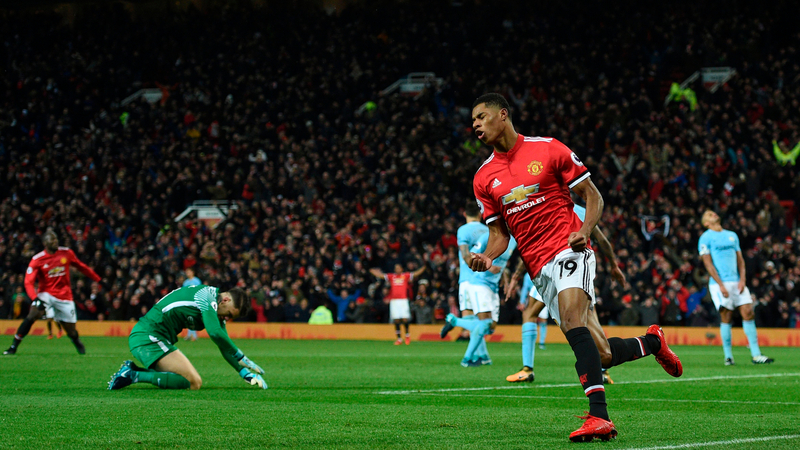 However, Rashford stepped up, and hit it well over the bar. Zlatan came on for Lingard. United could’ve had a penalty, when Herrera intercepted a loose pass from Otamendi in the penalty area. It looked like the Argentine defender might’ve stuck a foot out, and Herrera went down. The referee saw otherwise, and booked Herrera for diving. Herrera came off for Mata in a last throw of the dice. Some brilliant play from United lead to another clear cut chance, but Lukaku hit his shot right at Ederson. Mata tried to pounce on the rebound, but his effort was also blocked by Ederson, and City were just able to clear it away. That would prove to be United’s last chance of the match, as the game ended 2-1. United’s next match is against Bournemouth on Wednesday.